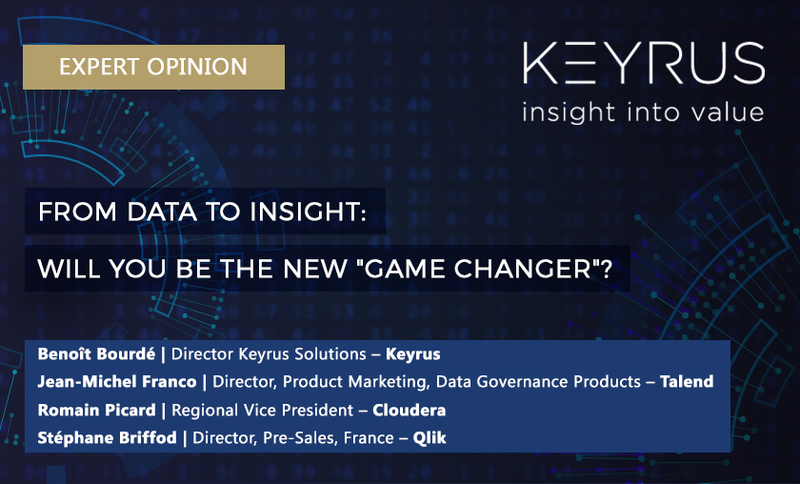 KEYRUS | From data to insight: will you be the new "game changer"? From data to insight: will you be the new "game changer"? From now on, customers will be loyal only if the customer relationship they experience, and the customer service they receive, are of sufficient quality. Major companies can satisfy these requirements by enabling those individuals within them who interact with customers to take real-time actions based on customer insight. In so doing, those companies can break away from the old way of thinking, in which what mattered most was to always "sell more", so as to move over to a new rationale, under which the objective is to "sell more effectively". Moreover, they can achieve this without having to completely overhaul their information systems and organizations! The upshot of all this is a feeling of dissatisfaction that weighs down heavily on customers' decisions whether to make an initial or repeat purchase – a dissatisfaction that diminishes not only their receptiveness to up-selling and cross-selling proposals, but also their propensity to recommend a company whose quality of service has disappointed them. Thanks to artificial intelligence technologies, combined with powerful technologies for handling Big Data and for aggregating and visualizing information, these iconic companies offer their customers the highest level of attentiveness to their requirements, services, and responsiveness – on all interaction channels, and in real time. All major companies are today sitting on top of an incredible wealth of data: they have decades of histories (for sales, contracts, complaints, etc.) and terabytes of customer data (identity, address, telephone number, age, composition of the household…). Added to this are customer navigation histories, as well as all kinds of information which customers leave on social networks, or even during their contacts with sales outlets and customer service departments. Moreover, as part of their digital transformation strategy, the major companies have all understood the need to decompartmentalize those information silos around which they previously structured themselves, so as to locate new reserves for creating value. Today, they function according to a "Data-Driven" model, in which data serves primarily to identify trends after the event. It remains for them to cross over the line that still separates them from the current champions of the customer experience: by transforming data into insights, in other words, knowledge that can directly be used for taking action and, as the companies receive feedback, continually ajusting their value proposition by analyzing, in real time, the results of the action and interactions, so as to draw fresh insights from them. Connecting data to action as it does, this "InsightDriven" model is not just the one practised by Uber, Airbnb, Amazon and Google… It is also – by default – the one adopted by all companies now being set up. As the latest cognitive technologies (AI) and analytics have become entirely affordable, it now comes even more naturally to these new companies to integrate them. On the other hand, if existing, major companies are to shift from their current, "Data-Driven" model to an "Insight-Driven" one, they need to put in more effort. They already have the essentials: an overall strategy for digital transformation, data, teams, and processes. They merely lack the expertise to re-orchestrate what they already have, and structure the technologies that will enable them to inject analytics into the system and deliver smart and actionable information to all levels of the organization. All companies have clearly understood the need to jump on the customer relationship bandwagon. The willingness is certainly there, but companies will have to go through a farreaching metamorphosis if they want to remain competitive and keep on creating value. Indeed, if this transformation is to be achieved, operational teams need to be provided with detailed customer insight which will enable their contacts with customers to become more fluid, and thus ultimately improve their quality. It is all about feeding a personalized and continuous conversation with each customer, based on all that we know about them at the various moments of truth, together with what we can deduce from that information, in terms of that customer's expectations, needs, and appetite for such-andsuch a product. From a commercial and marketing point of view, this is a revolution: we are shifting from a simple push mode to a more targeted one. The collapse in the conversion rate achieved by outgoing call campaigns demonstrates that consumers have had enough of such solicitations, which they consider inappropriate4. When you are able to identify, with certainty, the individual entering into contact with you, and figure out their profile as early on as possible, you can dynamically adapt the experience you propose to them. It is then no longer a matter of selling "more", but rather of selling "more effectively", as part of a rationale of "customer care", taking due account of customers' individual trajectories. ● Having a single, dynamic, and real-time 360° view of the customer, which is far from being the reality in all companies, since the business systems (CRM, systems for managing marketing campaigns, customer interactions, etc.) do not take into account, in real time, all available information on the customer (for example, their last web visit). ● Knowing instantly what to do and what to say to the specific customer, through insights, in other words, action or product recommendations which fit with that customer's history and profile, and which are automatically fed into the interface of the operational staff member's work tools. If the customer experience is to be engaging, and more in line with expectations, it needs to be differentiated, unique, contextualized, and above all, non-intrusive. It has to be dynamic, simple, and consistent between all the various digital and physical interaction points. Traditional IT, notably Business Intelligence IT, is incapable of meeting these requirements with the desired level of granularity and proactivity. Having a dynamic view of the customer effectively involves reaching beyond the silos and information hierarchies to capture all the information likely to influence their behavior. As for being able to generate personalized recommendations in real time, that depends on the ability to detect, within all the available data, correlations and probability scores that provide answers to what are very specific operational questions: What is the most appropriate action to take right now to ramp up this customer? At what point in time, and by which channel, should I contact this other customer, who shows every sign that they are about to terminate their agreement? What should I propose to this other one, who is expressing dissatisfaction for the second time in a month? Whilst it is true that consumers appreciate the autonomy given to them by the "selfcare" tools available on websites and via mobile applications, when it comes to obtaining advice, or dealing with a complaint, the vast majority of consumers continue to prefer human contact – either face to face, or by telephone5. When staff members, working in branches and contact centers, find themselves in a position to advise a customer in real time, by having access to all necessary information about them, and whilst being sure that what they are telling, or recommending to, that customer is in line with the company's objectives, such a situation is not only reassuring for those staff members, but it also allows them to more fully demonstrate the value of their work. Moreover, it is by doing this that the contact center agents will be able to depart from their script and pre-prepared answers which customers are now overwhelmingly rejecting, and which drag down the reputation of this profession. If it is excellence we are aiming for, we still have to ensure that the data, information, and recommendations are delivered to the salespeople and customer advisers in a form which they can immediately understand and directly use. Visual analysis tools enable each user to not only create their own analyses, indicators, and graphic representations, but also to explore the data in an intuitive and dynamic way, depending on the course taken by the conversation with their customer. The new entrants appearing in all sectors of activity are taking market share by standing out through the customer experience they offer: an experience that is simpler, more fluid and convivial, and that generates not only customer satisfaction, but also a preference, and recommendations to others – in other words, that both gains the loyalty of existing customers, and allows new ones to be won over. In contrast to established companies, these new players do not need to go through a digital transformation and already utilize those technological bricks we have mentioned in order to capture data, transform them into customer insights, and make those insights the engine of growth for their business. So, in this age of the conversation, which is seeing the advent of so-called "full stack" apps, chatbots, and platforms - technologies that are constantly changing -, companies who want to stand out from the competition and stay in the race can no longer content themselves with traditional 360° visions of customers. They must embrace these technologies, which will enable them to meet the expectations of consumers who are now enjoying a connected experience, being lived out through ever smarter devices, and in a way that is all at once social, mobile, and collaborative. It is not about laying out on paper a full overhaul of organizations, systems, and processes. The data already exist, as do the technologies. Your customers will be the first ones to thank you, both by their loyalty, and their propensity to recommend you to others. Cf. Observatoire des services clients 2016 (BVA) et France Customer Experience Index 2016 (Forrester). In this study, 9,038 French people over 16 years of age were surveyed about their genuine experiences with 34 companies from the Banking, Retail, and e-Commerce sectors operating in France. No company was given either a score of "excellent" or "good" for the customer experience. 35% of them were ranked in the "acceptable customer experience" category, with the remaining 65% offering a customer experience considered to be "poor" or "very poor". Cf. Baromètre AFRC de l’effort client 2016 (Mediametrie). 55,117 French people of 18 years and over, surveyed in July 2016 about the effort involved in 27 situations/procedures with companies from 7 sectors: Distribution, Energy, Telecoms, Banking/Insurance, Transport, Public Services/Health, Games of chance. This is also evidenced by the fact that in the space of 6 months, more than 3 million French households registered themselves on Bloctel, the list of people refusing telephone solicitations, and also that they were disappointed to learn that the list does not prevent them from receiving calls from companies of which they are already customers. Cf. Accenture, Global Consumer Pulse Survey (2016). This observation is borne out in France, as well as in the United States, the United Kingdom, and, to a lesser extent, China.